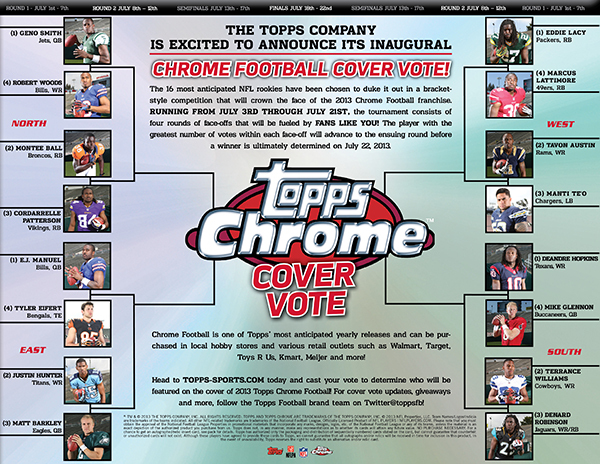 Topps has launched an online voting system to decide who will be on the cover of 2013 Topps Chrome Football. The bracket-style match-up begins with eight different match-ups. Between now and July 21, there will be four rounds of voting to determine who the face of the product will be. With so much of the focus of 2013 Topps Chrome Football on rookies, the 16 eligible players are all first-year players. In each match-up, the leading vote getter moves on. This continues until a winner is crowned. Voting takes place at topps-sports.com. 2013 Topps Chrome Football is slated to release in late-November.